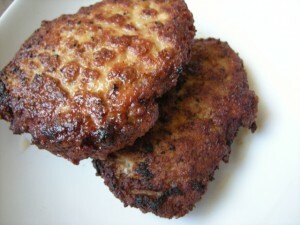 You can either freeze the chicken burger or fry them. If you want to eat them straight away, then you will need to fry them in a small pan and let them bottom fry properly before turning over the burger. This will ensure that the bottom of the burger is firm when you flip it over. Just came back from a fabulous holiday in Menorca. It is pleasantly surprising that the one place that we’ve been trying to avoid for so long turned out to be one of the best places we’ve visited so far. The reason for avoiding Spain is because it’s a cheap getaway and most touristic places there have lost their Spanish uniqueness in a bid to please an ever growing influx of British tourists. You tend to get more British food like “Fish & Chips”, “Baked Beans & Omelette” instead of traditional Spanish dishes. Another reason for not wanting to go Spain was that the beaches did not seem very pretty in the pictures I’ve looked at (and I’ve looked at hundreds of them!). My idea of a beautiful beach is one which is calm, turquoise in colour (or light blue or green), transparent (you can see right through the water to the bottom) and finally the sea level progressively takes you into deeper water. 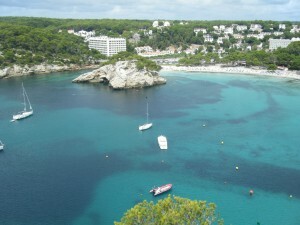 Spain itself was not ideal but The Balaeric Islands which constitute Menorca, Mallorca, Ibiza are very nice. The holiday spot was in Cala Galdana in Menorca on a self catering basis for 1 week. The apartment we stayed at had the basic things we needed (cooker, fridge, microwave, toaster, kettle), 2 bedrooms (4 single beds), 1 sofa bed, bathrom and toilet and an outdoor table with chairs. The apartment was situated on a slope with quite a few stairs to get to. However it was only 5 mins walking from the beach. There are 2 supermarkets just outside the apartment where you can get pretty much everything (milk, eggs, cooking oil, drinks, bread, cheese, pasta & sauces, chips and fry ups). The exchange rate for Euros was crap (nearly 1 pound sterling for 1 euro) so things seemed much more expensive than I thought they would. Eating outside costs a lot of money (dish of Paella 13 euros, monk fish with shellfish in sauce 23 euros). There are some fantastic excursions out there which are really worth it like visiting 6 beautiful beaches in a glass bottom boat for 12 euros each but we waited too late and didn’t manage to do this one. There’s a chu-chu train which takes you round Cala Galdana for 6 euros each and it’s well worth it because you get to know the place and it takes you on a hill where you get an amazing view of the beach from the top. So far, this holiday has been the best compared to Turkey and Egypt due to the fact that people don’t hassle you into buying stuff and the lagoon was really nice to swim in (btw you can’t really swim in the sea in Turkey and Egypt, they are awful). Unbelievable, I’ll tell you. Just when I wasn’t expecting it, it happened. I was going to clean the chicken coop and as I was passing by the chicken run, I saw a tiny egg looking directly at me. It didn’t click at first but then I realised it was my very first organic egg from my own garden. The proud hybrid has given me my first egg. Just can’t wait to taste it now, yummy! Tiger Billy and Jet Li had their first vaccine yesterday and it costs me £100 for the two of them. They were also given a worm medicine when I took them to the vets and that was £12 and should last a couple of days. They need to go for another vaccine in 3 weeks time. Fortunately I don’t have to pay for that because it was all paid when I went first time round. However the second vaccine is really important because the first vaccine would not work if they don’t have the second injection. Oh, the receptionist was trying to make me buy cat insurance btw. It was with Pet Plan and the first month was completely free. Well I don’t see my cats having any problems in the coming month, so I don’t really need the insurance cover. However if i gave that pet insurance a go, then it would be difficult for me to cancel it – as it’s always the case when you get free insurance cover; you either forget to cancel the insurance and are billed for something you don’t want or it becomes such a hassle for you to stop/get rid of the insurance cover that it becomes too much of a stress and you wonder why in the first place you agreed to sign up for it.